TALL-1 is a member of the TNF family that is critically involved in B cell survival, maturation, and progression of lupus-like autoimmune diseases. TALL-1 has three receptors, including BCMA, TACI, and BAFF-R, which are mostly expressed by B lymphocytes. Gene knockout studies have indicated that BAFF-R is the major stimulatory receptor for TALL-1 signaling and is required for normal B cell development. The intracellular signaling mechanisms of BAFF-R are not known. In this report, we attempted to identify BAFF-R-associated downstream proteins by yeast two-hybrid screening. This effort identified TNFR-associated factor (TRAF)3 as a protein specifically interacting with BAFF-R in yeast two-hybrid assays. Coimmunoprecipitation experiments indicated that BAFF-R interacts with TRAF3 in B lymphoma cells and this interaction is stimulated by TALL-1 treatment. Domain mapping experiments indicated that both a 6-aa membrane proximal region and the C-terminal 35 aa of BAFF-R are required for its interaction with TRAF3. Moreover, overexpression of TRAF3 inhibits BAFF-R-mediated NF-κB activation and IL-10 production. Taken together, our findings suggest that TRAF3 is a negative regulator of BAFF-R-mediated NF-κB activation and IL-10 production. TALL-1, also called BAFF, Blys, THANK, and zTNF4, is a member of the TNF family of ligands identified by us and others (1, 2, 3, 4, 5). TALL-1 is specifically and constitutively expressed by monocytes, macrophages, and dendritic cells (1, 2, 3, 6), and is induced by IFN-γ and IL-10 (3, 6). Like most members of the TNF family, the extracellular domain of TALL-1 can be cleaved to form a soluble cytokine (2). Crystal structure studies suggest that soluble TALL-1 (sTALL-1)3 contains an unique “flap” region that is important for its virus-like assembly, receptor binding, and biological activities (7, 8, 9). TALL-1 signals through three receptors, including BCMA, TACI, and BAFF-R, which are members of the TNFR family (5, 10, 11, 12, 13, 14, 15, 16, 17, 18, 19, 20, 21, 22, 23, 24). All three receptors are mainly expressed by B lymphocytes, while TACI is also induced in a subset of T cells following their activation (17, 18, 19, 20, 21, 22, 23, 24). Early studies suggest that sTALL-1 can potently stimulate B lymphocyte proliferation in vitro, either alone or in synergy with anti-IgM (2, 3, 10, 11, 12, 13). It is now believed that sTALL-1 promotes either differentiation of B cells or survival of mature B cells (25, 26, 27, 28). Administration of recombinant sTALL-1 or overexpression of sTALL-1 in mice leads to increased numbers of mature B lymphocytes, splenomegaly, anti-DNA Abs, proteinuria, and glomerulonephritis, phenotypes that mimic those of systemic lupus erythemia (3, 5, 14, 29, 30). Conversely, it has been shown that recombinant soluble TACI-Ig fusion proteins can significantly inhibit progression of lupus-like autoimmune syndrome and collagen-induced arthritis in animal models (27, 31). Recently, gene knockout studies further confirmed that TALL-1 is required for normal B cell development (26). Surprisingly, gene inactivation studies also indicated that BAFF-R, but not TACI and BCMA, is required for TALL-1-triggered B cell development (26, 32, 33, 34). Taken together, these studies suggest that the TALL-1/BAFF-R signaling plays critical roles in regulation of B cell function and autoimmune diseases. The signal transduction pathways triggered by BCMA, TACI, and BAFF-R are poorly characterized. Like many other members of the TNFR family, BCMA and TACI can bind to TNFR-associated factor (TRAF) proteins and activate the transcription factor NF-κB and the serine/threonine protein kinase JNK (10, 11, 12, 13, 16, 35). In addition, it has also been shown that TACI can activate the transcription factor NF-AT (36). The intracellular signaling pathways and downstream effectors triggered by BAFF-R are not known. In this study, we identified TRAF3 as a BAFF-R-associated protein. Our findings suggest that TRAF3 negatively regulates BAFF-R-mediated NF-κB activation and IL-10 production. Mammalian-derived recombinant Flag-tagged human sTALL-1 (10) and Escherichia coli-derived recombinant His6-tagged human sTALL-1 (7) were previously described. The human embryonic kidney 293 (Dr. Z. Cao, Tularik, South San Francisco, CA), the B lymphoma Bjab (Dr. J. Hagman, National Jewish Medical and Research Center, Denver, CO) and RPMI 8226 (American Type Culture Collection (ATCC), Manassas, VA) cells, the mAbs against Flag (Sigma-Aldrich, St. Louis, MO) and hemagglutinin (HA) (Covance, Berkeley, CA) epitopes, and the rabbit polyclonal anti-TRAF3 Ab (Santa Cruz Biotechnology, Santa Cruz, CA) were obtained from the indicated sources. Bjab and RPMI 8226 cells were cultured in RPMI 1640 medium containing 10% FBS. 293 cells were maintained in high glucose DMEM containing 10% FCS. To construct a BAFF-R bait vector, a cDNA fragment encoding for aa 97–184 of BAFF-R was inserted in-frame into the Gal4 DNA-binding domain vector pGBT (Clontech Laboratories, Palo Alto, CA). The human B cell cDNA library (ATCC) was screened as described (37, 38). 293 cells (5 × 106) were transfected with the indicated plasmids. Twenty-four hours after transfection, cells were lysed in 1 ml lysis buffer (20 mM Tris (pH 7.5), 150 mM NaCl, 1% Triton, 1 mM EDTA, 10 μg/ml aprotinin, 10 μg/ml leupeptin, 1 mM PMSF). For each immunoprecipitation, 0.4 ml aliquot of lysates was incubated with 0.5 μg of the indicated mAb or control mouse IgG, and 25 μl of a 1:1 slurry of GammaBind G Plus Sepharose (Amersham Pharmacia Biotech, Piscataway, NJ) for at least 1 h. The Sepharose beads were washed three times with 1 ml lysis buffer containing 500 mM NaCl. The precipitates were fractionated on SDS-PAGE and subsequent Western blot analyses were performed as described (37, 38). To construct C-terminal HA-tagged expression plasmids for BCMA, TACI, BAFF-R, and BAFF-R mutants, cDNAs for these proteins were amplified by PCR from a B cell cDNA library and inserted into a C-terminal HA-tagged pcDNA3 plasmid (39). To make retroviral vectors for TRAF3 and its TRAF domain (aa 258–568) mutant (TRAF3-C), cDNAs encoding for full-length TRAF3 and aa 258–568 were amplified by PCR and inserted into the MSCV2.2IRES-GFPα retroviral vector (provided by Dr. P. Marrack, National Jewish Medical and Research Center). Expression plasmids for TRAF1, 2, 3, 5, 6 (Dr. D. Goeddel, Tularik) and NF-κB-luciferase reporter plasmid (Dr. G. Johnson, University of Colorado Health Sciences Center, Denver, CO) were provided by the indicated investigators. Expression plasmids for C-terminal HA-tagged BCMA, TACI, and BAFF-R were linearized and transfected into RPMI 8226 cells or Bjab cells by electroporation. The transfected cells were selected by G418 (1 mg/ml) for 2 wk. Cells with high-level receptor expression were sorted with Flag-tagged sTALL-1 by flow cytometry. Overexpression of the receptors in the stable lines were confirmed by Western blot with anti-HA Ab. Retroviral plasmid (15 μg) for wild-type TRAF3 or TRAF3-C was transfected into the packaging cell line 293–10A1 (∼2 × 106) by calcium phosphate precipitation. Eighteen hours after transfection, the cells were washed with PBS and cultured in 5 ml of fresh medium for 24 h. The recombinant retrovirus-containing medium was collected and centrifuged. The supernatant, supplemented with 4 μg/ml of polybrene, was used to infect RPMI 8226 or Bjab cells (∼2 × 106). Two days after infection, green fluorescent protein-positive cells were isolated using a cell sorter. RPMI 8226 or Bjab cells were incubated in staining buffer (PBS/2% FBS) in the absence or presence of Flag-sTALL-1 (100 ng/ml) for 40 min. Cell staining was performed by sequential incubation (each 40 min) with anti-Flag mAb (1 μg/ml) and R-PE-conjugated goat anti-mouse IgG (1/200 dilution) in staining buffer. Cells were washed two times with staining buffer following each incubation. Cells with high-level Flag-sTALL-1 binding were isolated by a cell sorter. Bjab stable cell lines (∼2 × 105) were seeded on 6-well (35-mm) dishes and were transfected with 1.0 μg of NF-κB-luciferase reporter plasmid by Lipofectamine 2000 (Invitrogen, Carlsbad, CA). To normalize for transfection efficiency and protein amount, 0.5 μg of RSV-β-galactosidase plasmid was added to all transfections. Fourteen hours after transfection, cells were treated with His-sTALL-1 (200 ng/ml) or untreated for 6 h. Luciferase reporter assays were performed using a luciferase assay kit (BD PharMingen, San Diego, CA) and following the manufacturer’s protocols. β-Galactosidase activity was measured using the Galacto-Light chemiluminescent kit (Tropix, Medford, MA). Luciferase activities were normalized on the basis of β-galactosidase expression levels. Human IL-10 ELISA were performed using the human IL-10 ELISA Ready-Set-Go kit (eBioscience, San Diego, CA) by following procedures recommended by the manufacturer. The intracellular signaling pathways mediated by BAFF-R are unknown. Similar to other members of the TNFR family, BAFF-R does not have intrinsic enzymatic activity and is believed to transduce signals through physical interaction with downstream signaling proteins. To identify BAFF-R-associated signaling proteins, we used the yeast two-hybrid system to screen a human B cell cDNA library with the intracellular domain of BAFF-R as bait. We screened a total of 5 million independent clones and obtained 78 β-galactosidase-positive clones. Sequence analysis of 20 clones indicated that most clones encode a poorly characterized protein p14.5 (40). Subsequent transient transfection and coimmunoprecipitation experiments indicated that BAFF-R did not interact with p14.5 in 293 cells (data not shown). One of the sequenced clones encodes for TRAF3. Because TRAF proteins are involved in signaling by many members of the TNFR family (41, 42, 43), we decided to investigate a potential role for TRAF3 in BAFF-R signaling. To determine whether TRAF3 is associated with BAFF-R in mammalian cells, expression plasmids for C-terminal HA-tagged BAFF-R and N-terminal Flag-tagged TRAF3 were transfected into 293 cells. Coimmunoprecipitation experiments indicated that BAFF-R interacted with TRAF3 (Fig. 1⇓A). 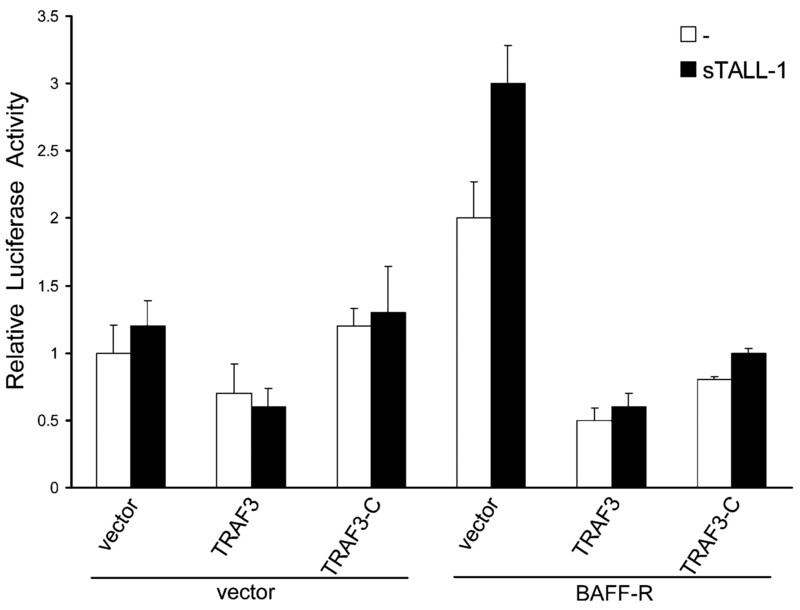 In the same experiments, BAFF-R did not interact with other cytoplasmic TRAF proteins, including TRAF1, TRAF2, TRAF5, and TRAF6 (Fig. 1⇓A). TRAF4 was not included in these experiments because it is primarily localized in the nucleus in mammalian cells (41, 42, 43). These data suggest that BAFF-R specially interacts with TRAF3. BAFF-R interacts with TRAF3 in 293 cells. A, BAFF-R interacts with TRAF3 but not TRAF1, 2, 5, and 6. 293 cells were transfected with expression plasmids for C-terminal HA-tagged BAFF-R and the indicated Flag-tagged TRAF proteins. Cell lysates were immunoprecipitated with anti-HA Ab or control mouse IgG. The immunoprecipitates were analyzed by Western blot with anti-Flag Ab (upper panel). 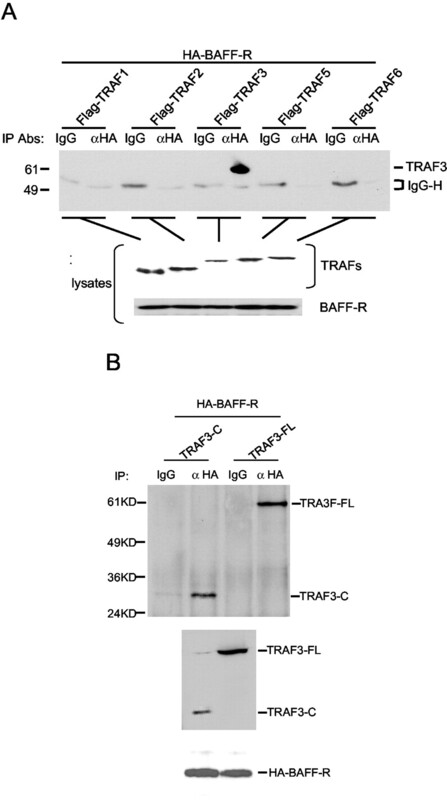 Expression of BAFF-R and TRAF proteins was confirmed by Western blots with anti-HA (lower panel) and anti-Flag (middle panel) Abs, respectively. B, The TRAF domain of TRAF3 is sufficient for interaction with BAFF-R. 293 cells were transfected with expression plasmids for C-terminal HA-tagged BAFF-R and wild-type TRAF3 or its TRAF domain mutant. Cell lysates were immunoprecipitated with anti-HA Ab or control mouse IgG. The immunoprecipitates were analyzed by Western blot with anti-TRAF3 Ab, which recognizes the C-terminal TRAF domain of TRAF3 (upper panel). Expression of BAFF-R, TRAF3, and its mutant was confirmed by Western blots with anti-HA (lower panel) and anti-TRAF3 (middle panel) Abs, respectively. TRAF proteins interact with members of the TNFR family through their TRAF domains (41, 42, 43). We determined whether the TRAF domain of TRAF3 (TRAF3-C) is sufficient to interact with BAFF-R. As shown in Fig. 1⇑B, transient transfection and coimmunoprecipitation experiments suggest that the TRAF domain of TRAF3 is sufficient for interaction with BAFF-R. Previously, conserved TRAF-binding motifs, such as (P/S/A/T)x(Q/E)E and PxQxxD, have been identified in the cytoplasmic domains of some TNFR family members (41, 42, 43, 44). However, these conserved TRAF-binding motifs are not easily recognizable in the cytoplasmic domain of BAFF-R. To determine the regions of BAFF-R that are required for interaction with TRAF3, we constructed a series of C-terminal HA-tagged deletion mutants of the BAFF-R (Fig. 2⇓A). Transient transfection and coimmunoprecipitation experiments suggest that six aa (PDGDKD) at the membrane proximal region (aa 117–122) and the C-terminal tail (aa 150–184) are both required for interaction with TRAF3 (Fig. 2⇓, A and B). Domain mapping of BAFF-R interaction with TRAF3. A, A schematic presentation of the BAFF-R deletion mutants and their interaction with TRAF3. ECD, extracellular domain; TM, transmembrane domain; ICD, intracellular domain; +, interaction detected; −, no interaction. B, Coimmunoprecipitation between TRAF3 and BAFF-R mutants. 293 cells were transfected with expression plasmids for Flag-tagged TRAF3 and the indicated C-terminal HA-tagged BAFF-R mutants. Cell lysates were immunoprecipitated with anti-HA Ab and the immunoprecipitates were analyzed by Western blot with anti-Flag Ab (upper panel). Expression of BAFF-R mutants and TRAF3 was confirmed by Western blots with anti-HA (middle panel) and anti-Flag (lower panel) Abs, respectively. Under physiological conditions, BAFF-R is specifically expressed in B lymphocytes. We next determined whether BAFF-R interacts with TRAF3 in B lymphoma cells and whether this interaction is affected by TALL-1 stimulation. To do this, the Bjab lymphoma cells were stably transfected with C-terminal HA-tagged BAFF-R, BCMA, and TACI. To determine whether BAFF-R is associated with endogenous TRAF3 in these cells, we performed coimmunoprecipitation experiments with anti-HA Ab and the immunoprecipitates were analyzed by Western blots with anti-TRAF3 Ab. These experiments indicated that BAFF-R could weakly interact with endogenous TRAF3 in Bjab cells (Fig. 3⇓). Moreover, sTALL-1 stimulation significantly enhanced the interaction between BAFF-R and TRAF3. The weak interaction between BAFF-R and TRAF3 in the absence of sTALL-1 is probably due to the fact that overexpression of BAFF-R mimics TALL-1 stimulation of endogenous BAFF-R. It is possible that the association of TRAF3 with BAFF-R is dependent on TALL-1 stimulation in untransfected cells. In these experiments, TRAF3 was also recruited to TACI, but not to BCMA, in a ligand-dependent manner (Fig. 3⇓). These data are consistent with previous observations that TRAF3 interacts with TACI, but not BCMA, in mammalian overexpression systems (10, 13). BAFF-R interacts with endogenous TRAF3 in B lymphoma cells. Bjab cells stably transfected with HA-tagged BCMA, TACI, BAFF-R, or a control vector were treated with sTALL-1 (200 ng/ml) (+) or left untreated for 5 min. Cells were then lysed and the lysates were immunoprecipitated with anti-HA Ab. The immunoprecipitates were analyzed by Western blot with anti-TRAF3 Ab (upper panel). 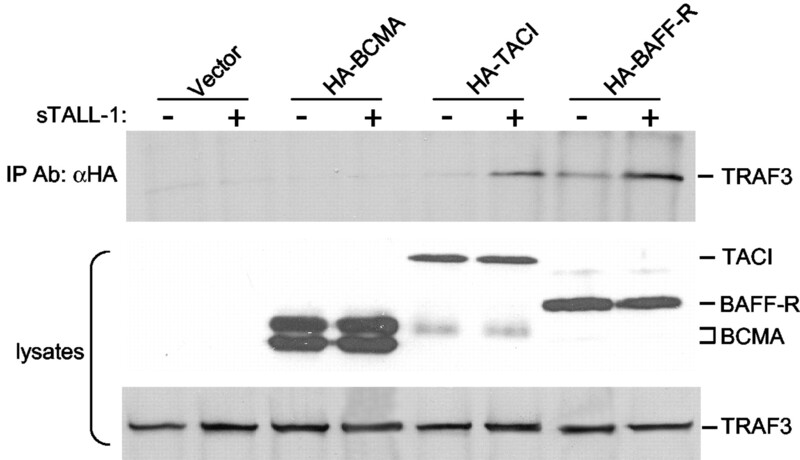 Expression of BCMA, TACI, and BAFF-R was confirmed by Western blot with anti-HA Ab (middle panel). Expression of endogenous TRAF3 was confirmed by Western blot with anti-TRAF3 Ab (lower panel). Many TNFR family members, including TALL-1 receptors BCMA and TACI, can activate the transcription factor NF-κB. Previously, we have shown that TALL-1 can induce NF-κB activation in the B lymphoma RPMI 8226 cells (39). To determine whether BAFF-R can activate NF-κB, we transfected a NF-κB-luciferase reporter plasmid into Bjab cells overexpressing BAFF-R. Luciferase assays indicated that overexpression of BAFF-R could significantly induce NF-κB activation, and this effect was enhanced by sTALL-1 stimulation (Fig. 4⇓). Moreover, overexpression of TRAF3 and TRAF3-C both inhibited BAFF-R-mediated NF-κB activation (Fig. 4⇓). TRAF3 inhibits BAFF-R-mediated NF-κB activation. 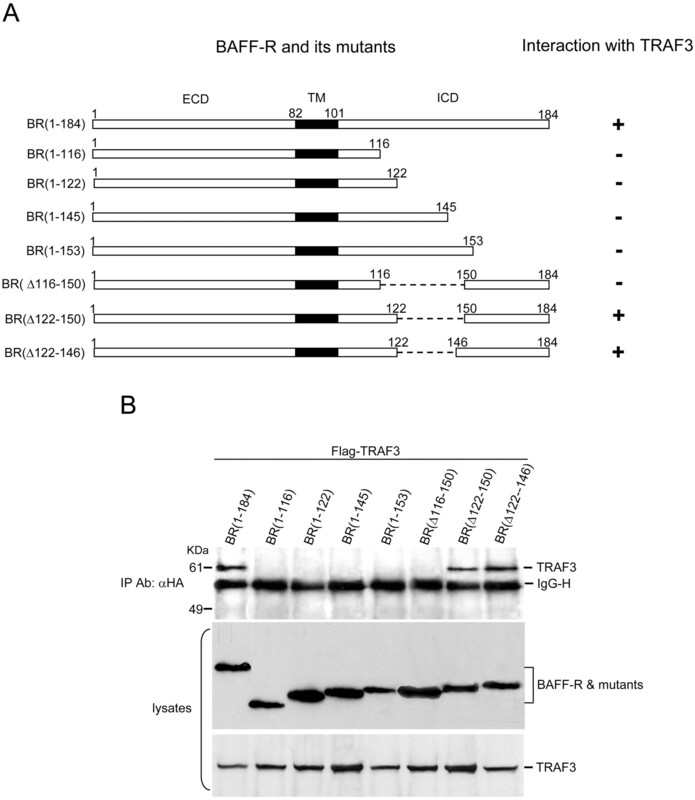 Bjab cells stably overexpressing BAFF-R, or BAFF-R plus TRAF3 or TRAF3-C, were transfected with NF-κB-luciferase and RSV-β-galactosidase reporter plasmids. Fourteen hours after transfection, cells were treated with sTALL-1 (200 ng/ml) (▪) or left untreated (□) for 6 h. Luciferase activities were measured and normalized based on β-galactosidase levels. Data shown are averages and SDs of one representative experiment in which each transfection was performed in triplicate. Previously, we showed that TALL-1 stimulation or overexpression of BAFF-R in RPMI 8226 cells induced IL-10 production (39). To determine whether TRAF3 is involved in BAFF-R-induced IL-10 production, we transfected TRAF3 or its TRAF domain into BAFF-R-overexpressing RPMI 8226 cells by retroviral-mediated gene transfer and measured IL-10 levels by ELISA. The results indicated that both wild-type TRAF3 and TRAF3-C inhibited BAFF-R-induced IL-10 production (Fig. 5⇓). Effects of TRAF3 on TALL-1- and BAFF-R-induced IL-10 production. A, TRAF3 inhibits TALL-1-induced IL-10 production in RPMI 8226 cells. RPMI 8226 cells stably transfected with empty control or TRAF3 plasmid were treated with sTALL-1 (100 ng/ml) for 24 h (+) or left untreated −. IL-10 levels in the culture supernatants were measured by ELISA. B, TRAF3 inhibits BAFF-R-mediated IL-10 production. IL-10 levels in culture supernatants of RPMI 8226 cells stably transfected with BAFF-R, or BAFF-R plus TRAF3 or TRAF3-C were measured by ELISA. Data shown are averages and SDs of three independent experiments. After migrating from the bone marrow to the spleen, immature B cells undergo two transitional stages, transitional type I and II (T2), before differentiating into naive mature B cells. In vitro experiments suggest that sTALL-1 specifically promotes the survival of T2 B cells and their differentiation into mature B cells (25, 27, 28). Consistent with these observations, inhibition of TALL-1 signaling by administration of TACI-Ig decoy receptor or gene knockout of TALL-1 causes deficiency of T2 and mature B cells (26, 27, 31). These studies point to a crucial role for TALL-1 in B cell survival and maturation. Among the three TALL-1 receptors, BCMA and TACI are not important for B cell development because normal B cell maturation is found in BCMA- and TACI-deficient mice (32, 33, 34). In contrast, inactivation of BAFF-R in mice causes loss of T2 and mature B cells (26). These studies suggest that BAFF-R signaling is essential for TALL-1-triggered B cell survival and maturation. The downstream effector molecules responsible for TALL-1/BAFF-R-triggered B cell survival and maturation are not clear. It is possible that TALL-1 signaling initiates the anti-apoptotic activity that is associated with the activation of NF-κB. Previously, it has been shown that disruption of NF-κB activation pathways, such as by gene knockout of IKKα, Rel, and RelA, impairs B cell maturation (45, 46, 47). In this context, we found in this study that BAFF-R could also activate NF-κB. Both BCMA and TACI can activate NF-κB but are not important for TALL-1-triggered B cell survival, suggesting that activation of NF-κB is not sufficient for TALL-1-triggered B cell survival. Recently, we identified multiple downstream genes transcriptionally induced by TALL-1, including the cytokine IL-10, the chemokine LAG-1, and GCP-2, the secreted protein pre-B cell colony enhancing factor, among others (39). Among the genes induced by TALL-1, IL-10 is particularly interesting. It has been shown that IL-10 can suppress cytokine production and several accessory cell functions by Th1 cells, macrophages, and NK cells and is regarded as a potent suppressor of the effector functions of these cells (48). Conversely, IL-10 is a potent stimulator of B cell proliferation and differentiation and is critically involved in regulating autoantibody-secreting B cell activities in systemic lupus erythemia (49, 50). Our previous studies suggest that BAFF-R, but not TACI and BCMA, can dramatically up-regulate IL-10 expression in primary and transformed B cells (39), pointing to the possibility that IL-10 is an important effector molecule for TALL-1-triggered B cell survival and maturation. In an attempt to decipher the intracellular signaling pathways mediated by BAFF-R, we identified TRAF3 as a cytoplasmic protein physically binding to the cytoplasmic domain of BAFF-R. TRAF3 is a member of the TRAF protein family, which is involved in signaling by many members of the TNFR family (41, 42, 43). TRAF3 was first identified as a molecule that binds to the cytoplasmic tails of CD40 and EBV-transforming protein LMP1 (51, 52, 53, 54). Signaling through CD40 in B cells causes rescue from apoptosis, proliferation, differentiation, Ig production, class switching, and expression of costimulatory molecules. Overexpression of TRAF3 inhibits CD40-mediated Ab secretion (54). The TRAF domain of TRAF3 is sufficient to bind to CD40 and also inhibits CD40-mediated Ab secretion when overexpressed, suggesting that the physical association of TRAF3 with CD40 mediates its negative regulatory function (55). TRAF3 is also recruited in a ligand-dependent manner to lymphotoxin-β receptor (LTβR) and has an inhibitory effect on LTβR-mediated NF-κB activation (56, 57). In this context, it is interesting that both TRAF3 and its TRAF domain inhibit BAFF-R-mediated downstream effects, such as NF-κB activation and IL-10 production. Taken together, these studies suggest that TRAF3 is involved in negative regulation of signaling by several TNFR family members, including BAFF-R, CD40, and LTβR. The cytoplasmic domain of BAFF-R is not conserved with those of other TNFR family members. The major conserved TRAF-binding motif, (P/S/A/T)x(Q/E)E (44), is not easily recognizable in the cytoplasmic domain of BAFF-R. A 6-aa sequence at position 117 of BAFF-R, PDGDKD, is weakly similar to the minor consensus TRAF-binding motif PxQxxD found in the EBV LMP1 protein and the TRAF-interacting protein I-TRAF/TANK (44). Previously, it has been shown that TRAF3 binds to LTβR through amino acids PEEGDPG at position 389 of LTβR (57). This site is also not found in BAFF-R. We made a series of deletion mutants of BAFF-R and examined their interaction with TRAF3 in coimmunoprecipitation experiments. These studies suggest that the PDGDKD motif at position 117 and the C-terminal 35 aa are both required for BAFF-R’s association with TRAF3. The simplest explanation for this observation is that these amino acids form a novel spatial structure for BAFF-R binding to TRAF3. In this context, it has previously been shown by crystal structure studies that binding of TRAF3, but not TRAF2, to CD40 is influenced by both the PXQXT motif and residues distal to this site (58, 59, 60). Alternatively, it is also possible that TRAF3 binds only to one site in the cytoplasm of BAFF-R in vivo and the results from our mapping experiments are due to altered folds caused by deletion. In conclusion, we have identified TRAF3 as a BAFF-R-associated signaling protein. TRAF3 can inhibit BAFF-R-mediated NF-κB activation and IL-10 production, suggesting a negative regulatory role for TRAF3 in TALL-1-triggered B cell survival and maturation. We thank Drs. Zhaodan Cao, David Goeddel, Gary Johnson, and Philippa Marrack for reagents. 1 This work was supported by grants from the Ellison Medical Foundation, National Institutes of Health (1RO1 AI49992-01), Arthritis Foundation, National Natural Science Foundation of China (39925016), Chinese “863” Program (2001AA221281), and Special Funds for Major State Basic Research of China (G19990539). ↵3 Abbreviations used in this paper: sTALL-1, soluble TALL-1; T2, transitional type II; LTβR, lymphotoxin-β receptor; TRAF, TNFR-associated factor; HA, hemagglutinin. Senftleben, U., Y. Cao, G. Xiao, F. R. Greten, G. Krahn, G. Bonizzi, Y. Chen, Y. Hu, A. Fong, S. C. Sun, and M. Karin. Activation of IKKα by a second, evolutionary conserved, NF-κ B signaling pathway. Science 293:1495.